Hier sehen Sie die Kategorien und Ihren Fortschritt während der Beantwortung der Fragen. Erfahren Sie mehr nach dem Abschluss des Kalkulators. Klicken Sie auf das Foto und finden Sie heraus wie schwer ihr ökologischer Rucksack ist. Did anything catch your attention? Do you have any further questions? What are the "tons" included in the ecological backpack? The tons calculated here include the weight of all natural raw materials needed for your lifestyle. These include mineral raw materials (such as metal ores, crude oil or hard coal) as well as biomass (e.g. wood and food). Since every removal of raw material represents a human interference with the ecosystem and has ecological impacts, the ecological backpack also contains displaced rock and soil (e.g. soil excavated when building streets or overburden in open pit mining). Water use is not considered in this calculator. However, decreasing the amount of raw materials used often also leads to a decreased use in water, as water is needed for the extraction and processing of materials. What informative value does the ecological backpack have? 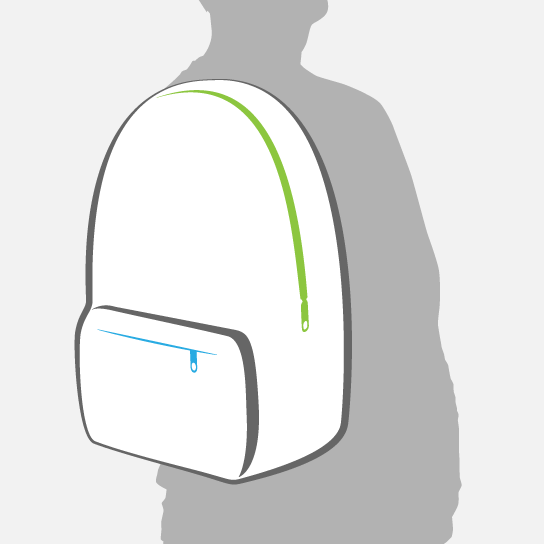 The ecological backpack can be used to estimate the pressure on the environment due to the use of a certain product or lifestyle. It is based on the "material input per service unit"-concept that was developed at the Wuppertal Institut in the early nineties. The concept is based on the logic that every removal of raw materials from nature has environmental impacts and often already causes damage at the place of extraction. Furthermore, the materials will sooner or later become waste again and be emitted into the environment. This can happen in different ways: for example as exhaust fumes during combustion, as waste on disposal sites or in waste water. If the overall extraction of raw materials is reduced, emissions into the environment are reduced as well. For this reason the ecological backpack focuses on the raw materials. What is the difference to the carbon footprint? The tons of the ecological backpack are not to be confused with the tons given by calculations of carbon emissions, also called carbon footprint. This well established ecological indicator is used to estimate greenhouse gas emissions and is often generally used to evaluate how environmentally friendly a product is. However, the carbon footprint only indicates impacts on climate change and does not consider other problems like e.g. the fact that raw materials are limited. Depending on whether you take into consideration the ecological backpack or the carbon footprint, slightly different suggestions for a sustainable lifestyle can result. For example a trip by airplane is not quite as bad concerning raw material use, but very bad for the climate. On the other hand buying a new car instead of using a second-hand one, can make sense with regard to the carbon footprint, if it uses less fuel; whereas the ecological backpack normally comes to the opposite conclusion. However, the main statement for all these approaches is: the less we consume the better. Where does the data for this calculator come from? The data used in this calculator is based on research data of the Wuppertal Institut and data from life cycle databases (e.g. Ecoinvent or the European Life Cycle Database).